Amanda at A Patchwork of Books has this great Picture Book Saturday feature, where she talks about different picture books that are connected by a certain theme. As a librarian that works with kids of all ages, picture books come across both the reference desk and my own desk everyday. I thought it would be fun to talk about some of those picture books from time to time - it might be once per month, it might be more. Meet Einsein, he is a scientist who loves to study light and gravity. Einstein helps to introduce your kids yo science, and show the, that they are already great scientists. 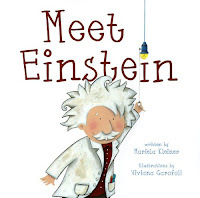 Meet Einstein is a great book for introducing young children (ages 3 to 5) to science. 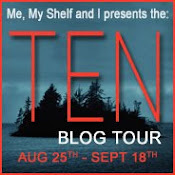 It has clear writing that uses examples that kids will recognize from everyday life. Ms. Kleiner starts off by introducing Einstein and explaining what a scientist is and then goes on to talk about light and gravity. She uses examples like food spilling from the table and a child jumping up and down to illustrate her points. 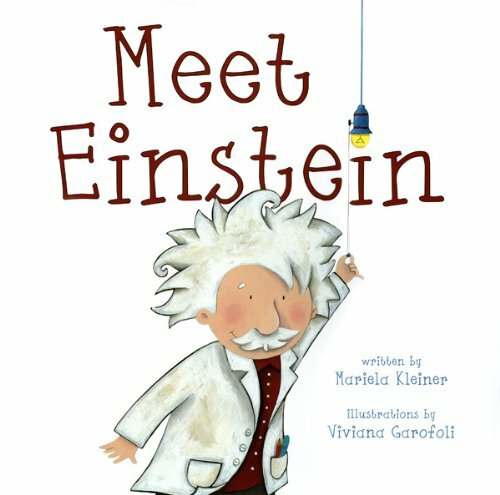 The writing reads like a conversation and I can see this book being the starting off point for teaching children both who Einstein is and about some of his discoveries. Ms. Garofoli's illustrations are a perfect match for the text. They are beautifully drawn and really catch the eye. I love that the endpapers at both the front and back of the book have illustrations of supplies a scientist might need to conduct experiments. Meet Einstein is terrific resource for parents. While I can't see using it as a read aloud for a group, this book is perfect for one on one reading. awww this is so cute! My younger brother would totally get a kick out of this!